Held at the Stoke Park Junior School in Eastleigh, Bookings Officer Nigel Smith and Executive Committee Member Alan Cobbold were on hand with new recruit John Tobin to introduce Scout leaders from across Hampshire and the wider area to the canal boating residential holiday experiences that LNBP can offer to Scouts and other uniformed organisations. Armed with our brochures and flyers, it was certainly a busy day with a steady stream of visitors keen and interested to find out more about us and what we can offer. Plus our new video was also shown regularly via laptop which certainly seemed to have a positive reception. We’re pleased to say we had a series of tentative enquiries on the day and in the proceeding days about bookings for later this year and 2020. In addition we are looking at setting aside a day in the coming months for a series of Hampshire Scout group leaders to come up to Braunston for a taster day and possible overnight stay to see our boats and experience a trip with us and everything we can offer for themselves. More details on this to be announced shortly. 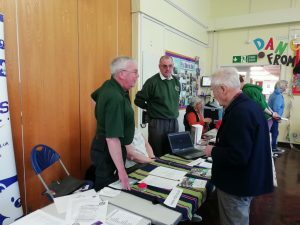 Many thanks to Hampshire Scouts for the opportunity to again showcase what we can provide to the Scouting network. And many thanks to Nigel, Alan and John for their time in attending the Rally on our behalf.